Car touch up paint will become a concern for most people. The harsh reality is that the world is forever giving in one harsh reality after another! ...so you better act and respond accordingly! Long or short, every road trip will be a new chance for more chips in your cars paint. The good news is that today you have far more options than before. When it comes to car paint chips and scratches, most people live under the assumption that the standard car touch up paint, with the messy applicator brushes or pen tips, are your only solution. These traditional touch up paint applicators are readily available at the car dealership where you bought your car, or any auto parts store. Most people are familiar with this type of touch-up paint applicators. While they offer a quick and easy fix for stone and rock chips in your cars paint, they also come with their share of drawbacks. You must remember that the goal with these car touch up paint kits is to camouflage the chips and scratches so they are less visible. Nothing short of the body shop is going to make your car perfect again. Good for a very quick and easy way to hide and conceal road rash, chips, and some scratches. The paint in car paint touch up pens is often temperamental: either too runny, or too thick unless you buy a quality kit like the TouchUpDirect below. Does require at least a semi-steady hand. If you have the shakes or tremors; this might be problematic for you. For most people including myself, these pen tip applicators seemed like the answer when these pen tip applicators started making their way into the car paint touch up market. At a casual glance these pen-tip applicators seem like the perfect solution over the traditional brush-tip applicators. Based on my experience it nothing more than the classic case of trading in one set of problems for another! Hard to get paint to flow from precise tip; constantly a problem. Most suited for the single, round type chips rather than long scratches. Difficult for any deep scratch of any length. 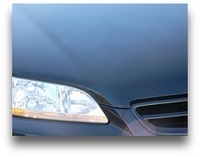 Knowing how to repair car paint scratches can become overwhelming very quickly. I have broken this subject down into 3 specific areas of concern. Use the following to help determine the best product or kit for you and your world. Most people simplify the topic of car paint scratches and think that one solution (car touch up paint) is a fix for every car scratch. This is simply not true. Every scratch will be truly unique in length, depth, and width. Some marks are not scratches but transfer marks. The good news is that many times the scratch you think is an actual car paint scratch, is really what is called paint transfer. These marks are much easier to deal with than an actual scratch in your car paint. You need to perform the finger nail test. Each scratch will need to be tested to determine the steps to take to remove the mark. Simply scrap across each mark with the tip of your fingernail to help determine whether it is an actual scratch, or some form of transfer that sits on top of the paint. This test will also help you determine how deep the paint scratch is. Note: If ALL you want to do is to fix the road rash on all the leading faces of your car then you can proceed down to the road rash section. But I would at least read this section first. Many scratches can be simply improved with this product to the point where car touch up paint is no longer necessary. This product is very effective at removing transfer from your car that you might have thought was a scratch. Using this on all the scratches first will not only "clean" the scratch up by removing any transfer, but revel the true nature of the damage you need to fix with car touch up paint. Once you have some of this handy car paint scratch remover on hand, moving forward you will be able to treat any new scratches or transfer that will be part of the ongoing ownership experience of any car. Meguiar's G10307 ScratchX 2.0-7 oz. Every one of you will get some kind of marks on your car that can be easily resolved with a scratch remover like this. Even if you have a deep paint scratch you are trying to repair with car touch up paint, you will benefit by "cleaning" it up first with this type of rubbing compound, then reassessing the area for repair. Often a person will have a scratch on their car that will go from being unacceptable to acceptable with a little aggressive use of this scratch remover. This is simply what happens to the front end of your as the paint gets chipped up from debris hitting your car at high speeds. The chips keep coming and before long, the forward facing edges of your car are riddled up with countless paint chips. Over time, the many chips will seriously detract and diminish the overall beauty of your cars paint. When thinking about trying to fill hundreds of paint chips on your front end, it might seem like a futile task. But with that said, don't underestimate just how much the beauty of your car can be enhanced by fixing the road rash. But using the traditional brush or pen tip applicators is a time consuming task. No one would deny the dramatic effect car touch up paint has on the front end of this Honda; what we really want though is a better solution to the inefficiency of the traditional car touch up paint applicators! Repair paint chips, certain types of scratches, and road rash professionally with Dr. ColorChip Paint Chip Repair Systems. Dr. ColorChip's incredible repair process results in smooth, perfectly matched paint with no paint blobs! High quality automotive paint and a proprietary blending solution will fill and hide paint blemishes in two simple steps. This is what I call the better solution! I recommend the Dr. Colorchip for road rash specifically, but is also effective on miscellaneous chips, and deep or wide scratches. If you only have longer and deeper scratches, I would recommend either the Turtle Wax paint scratch remover or the TouchUpDirect kit. When it comes to what I refer to as hairline scratches, often you can remove these completely, or diminish them to the point of acceptability if you have the right kit. Hairline scratches are just that; scratches that are the width of a human hair. You may still be able to catch an edge on these scratches with your fingernail, but they are not wide enough to actually accept any car touch up paint into them. If you use car touch up paint on hairline scratches, the paint will simply sit on top, or outside the edges of the scratch. This means you will simply trade one problem off for another. A scratch needs to either be deep enough, or wide enough to allow any form of car touch up paint to settle into the damage area. Otherwise the touch up paint will simply lay over the damage area and create a different kind of problem. This kit allows you do sand your way to success. You literately sand the area that has the scratch to remove as much of the surrounding clear coat. For men you can think of sanding wood that has a scratch in it. Women can think of getting their nails done and the beautician sanding your nails to remove ridges and scuffs in your nails. 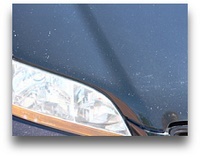 The same process can be done on your car paint to remove light, hairline scratches. This means you start with a course grit of sand paper (small sanding discs in this particular kit) and graduate down to a fine course of sand paper disc that then gets polish away with some polishing compound. This kit is the most user friendly kit I have found to date! When you have come to the conclusion that you are trying to fix deep scratches that require the use of actual car touch up paint then I recommend this kit below. I recommend this kit when you are dealing with individual scratches, chips, or you want to attempt to use touch up paint on any of the bigger chips of your front end without using the Dr. Colorchip for a complete road rash repair. Can also be used to do a full road rash repair and is very much identical to the Dr. Colorchip repair kit above. Now that you know a better fix to the traditional car touch up paint methods, you now have new alternatives to traditional pen style car touch up paint. A little effort and time on your part along with one or more of this products/kits, will leave a big smile on your face ounce you see the updated version of your car! I know the majority of guys (and gals) that visit my site are looking for useful tips for cosmetic car care. I realize that many of you would also like a reliable resource online when it comes to mechanical repairs and service of your car. It can be much easier and far less expensive to repair your car yourself, or to at least get a diagnosis from an expert before heading to the repair shop. The Automotive Experts on JustAnswer can answer questions, diagnose problems and guide you through any repairs you want to make yourself, any time day or night, for literally any make, model or age of vehicle.